Safety is the most critical requirement in the medical field, so delivering products have consistently high performance and consistently long life is our commitment. 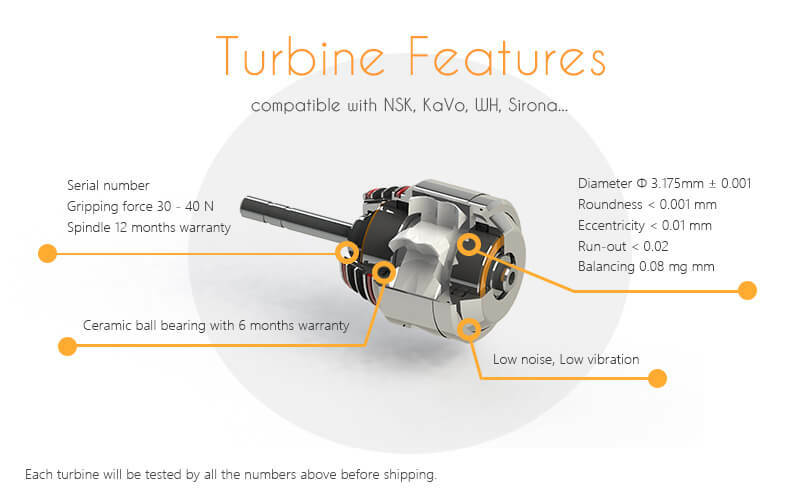 As a manufacturer, we promise all our products will be tested by the ISO 13485, CE0197 standard and all the numbers in the right pictures before everytime delivery.Every rotor is also marked with the serial number in front of the spindle, so it can be easily traced back to the date of production. All brands and models that are mentioned in MicroP marketing or sales material are registered trade names. No implication is made that any of our products are original products or that any of the referenced companies endorse our products. This clause applies to the following names, KaVo, Star Dental, Midwest, NSK, W&H, Sirona, Bien air.